ISRAEL - JUST THE FACTS: You Are NOT Going To Believe What This Muslim Woman Did To An Australian Police Officer! 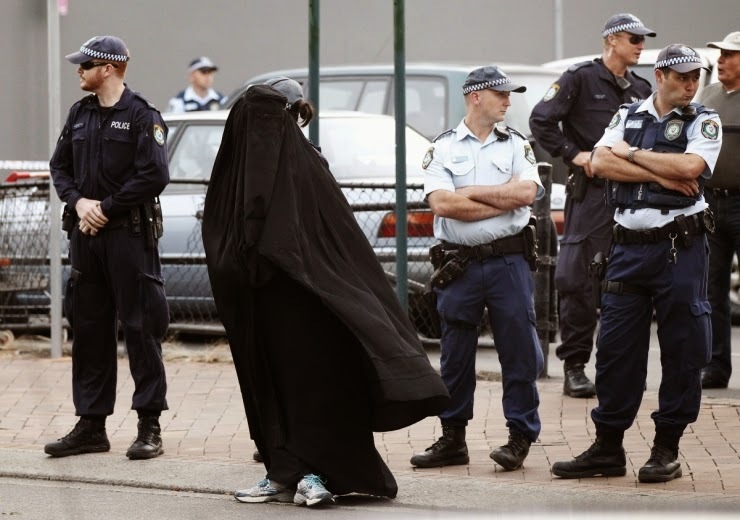 You Are NOT Going To Believe What This Muslim Woman Did To An Australian Police Officer! If you thought Pallywood was limited only to Islamic terrorism in Israel, wait till you see this video of a Muslim woman who attempted to pull the racist card on an Australian Police Officer and was caught red-handed! The woman in this picture is not connected to this story. Wait a second, you can't see the woman in this picture so she couldn't sue even if she wanted to! Her lawyer actually claimed that because she was in a hijab the police cannot be sure it was her! Australia is trying to pass a law against hijab wearing. FOR IT or AGAINST IT? Let me know in the comments below. SUPPORT ISRAEL - SUPPORT TRUTH! SHARE & SIGN the 'I Support Israel' petition on the upper right corner of the blog! One more thing, please let me know in the comments below what you thought about this post! Wow, eizo chutzpah! She gets to sue, but the police don't? Australia (and all other countries, too) should pass laws dealing with obscuring the identity, and particularly covering the face. An exception might be face masks due to blizzard conditions, for instance - but nevertheless, in a situation like the one above, the police should be able to require the woman (or man dressed as a woman - Muslims could potentially get away with that precisely because many modest women in their culture hide what would be the beard area on a man's face) to reveal her face. I wish them all the best in their efforts.